I wish you could enjoy the fragrances that were wafting through my kitchen as this simple chicken dish was cooking. It was the wine that you could detect. It is the wine that gives this dish its depth of flavor. Well, along with the Parmesan cheese and thyme. We really liked this dish. I just wish I had had some fresh thyme rather than using ground. I didn’t discover my thyme was not ‘worthy’ until after I had put the ingredients together and got ready to cook it. The color would have been really nice. AND after looking at my pictures I wish I had browned the chicken just a tad longer. Ah, well. 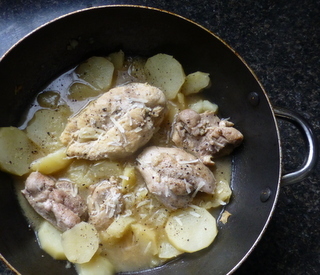 The potatoes, simmered in the wine and chicken broth take on the thyme flavor really nicely and the sauce is a great addition to the chicken itself. Definitely a repeat here. Thanks, Chaya, nice pick.